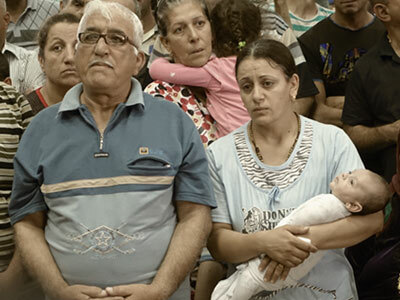 Displaced Iraqi Christians attending a worship service in northern Kurdistan. Photo credit: Barnabas Fund UK. In light of the advancement of ISIS and ISIL in the Middle East and the resulting decimation of numerous religious minority communities, I’ve received texts and phone calls asking how to navigate the large swath of media voices, and asking how Christians in particular can respond wisely. By God’s gracious design, I was invited by Jemar Tisby and Beau York of Pass the Mic to discuss the humanitarian situation in the region, and present a reasonable response for concerned Christians watching from a distance. By way of an update since the interview, humanitarian agency Barnabas Fund UK reported this week that the Islamist organization has clearly set its sights on territorial expansion in the region, with one of its primary aims the eradication of the Christian community. in other words, what has happened to religious minorities in Mosul may soon become normative for all dissenters in the region. I’ve been encouraging people not to approach the suffering church with tepid pity, but rather with compassionate identification. Understanding the internal, historical and ideological dynamics while avoiding sweeping rhetoric seems a good place to start. Listen to the interview here.